‘Festy’ is a multipurpose WordPress theme featuring several vibrant, Event layouts. 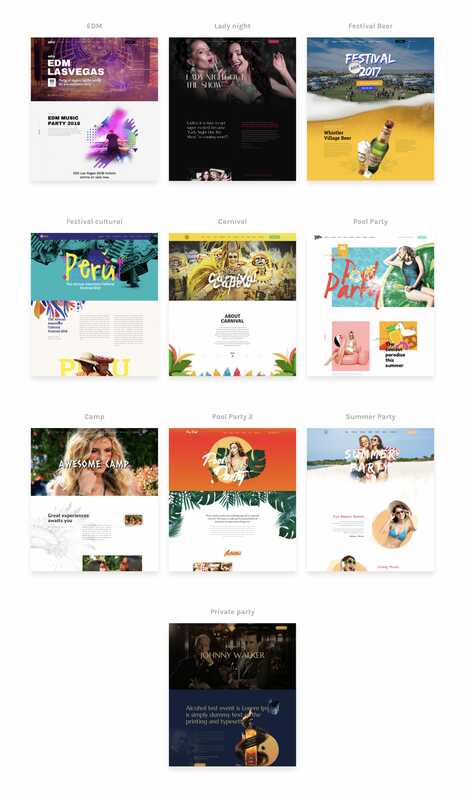 The Landing Page designs include one-click demos for EDM party, ladies night, beer festival, carnival, pool party, outdoor camps and more. Each layout is fully responsive and features beautiful load transitions, intro sliders, stunning colors, fresh typography and unique web design elements. Great to know the Festy WordPress theme comes with WP Bakery (valued at $34) page builder and Slider Revolution (valued at $25) plugins bundled in. Festy is an incredibly sleek and highly attractive, youthful and fresh, minimalist and polished, readily responsive creative multipurpose WordPress theme. This is a sophisticated platform that aims to streamline the design and be a perfect fit for any kind of Party.